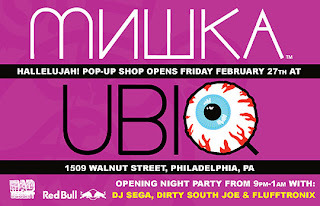 Mishka will be setting up shop this Friday inside of Ubiq in Philadelphia. If you are in the area there will be an opening night party from 9 until 1 at 1509 Walnut Street. Also watch for the grand opening of the Mishka flagship store at 350 Broadway...dates under wraps...but keep an eye on the next month or two.